As with most political systems, I’d imagine, Japan’s political elite have more than a slight dynastic nature. I plan to look at some of the family trees of Japan’s political figures over a series of articles. I will start with one of the most interesting: Taro Aso (??? ?, Tarou Asou), Minister for Foreign Affairs since 31 October 2005, as well as a candidate for Koizumi’s replacement as Prime Minister. Taro Aso is a politician born and bred. He is perhaps best known for his controversial statements reflecting his revisionist and conservative stance on Japan’s history. Others know him for being somewhat of a manga enthusiast, keen to use the popular form of entertainment as a source of soft power. Love him or hate him, Aso is here to stay. Taro Aso was born on 20 September 1940 in Iizuka, Fukuoka Prefecture. He is the oldest among his five siblings.Education – He studied in the Faculties of Politics and Economics at the prestigious Gakushuin University (???? ?, Gakushuuin Daigaku), whose other alumni includeStudio Ghibli head Hayao Miyazaki, Beatles wife Yoko Ono, and current Emperor Akihito. He then travelled to the US to study at Stanford University, but his family (particularly his grandfather, Shigeru Yoshida) called him back to Japan over fears he was becoming ‘too Americanised’. Aso attempted to reason with them, but they cut off his allowance forcing him to take a ship home. Aso then left again, this time to study at the University of London. Work – Following his time in London, Taro Aso worked for a diamond mining company in Sierra Leone. After two years, civil war forced him out of the country. In 1966, he joined the family company, Aso Industry (formerly Aso Mining Company, later Aso Cement Company), and held the post of president from 1973-1979. Life – Aso was on the Japanese shooting team at the 1976 Montreal Olympics. In 1978, Aso became president of the Japan Junior Chamber, a federation of Japan’s young business leaders. He is a devout Catholic, confirmed with the name Francisco (by which he is sometimes known), although partakes in Shinto rituals. Aso is a frequent reader of manga, said to read around 10-20 volumes a week, and is particularly known as a fan of Rozen Maiden (leading him to be dubbed ‘Rozen Aso’). In a campaign rally in Akihabara, a district of Tokyo renowned for its geeky visitors (otaku), he spent 60% of his time discusses pop-culture. He plays golf in his downtime. In the Diet – Aso is a member of the Kono Faction, an LDP group led by Yohei Kono (the politician who recognised the comfort women issue in his ‘Kono Statement’).Taro Aso was elected to the Diet’s Lower House (House of Representatives) in October 1979 and has been re-elected eight times. In 1988, Taro Aso became Parliamentary Vice Minister for Education, Sports, Science and Culture which he held until June 1989. From January 1991, Aso became Chairman of the Lower House’s Special Committee on Coal Issues, until November 1991, when he became Chairman of the Standing Committee on Foreign Affairs, which he held until Jan 1993. 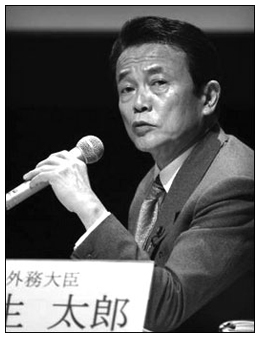 In November 1998, Aso became Chairman of the Special Committee on Fiscal Structure Reform, which he held for a month. In the LDP – In March 1990, Aso became director of the Education Division of the LDP, until December 1990. While still Chairman of the House of Representatives’ Standing Committee on Foreign Affairs, in November 1992, Aso became Director of the Foreign Affairs Division until Aug 1993. In March 1999, Aso was Deputy Secretary-General of the LDP, and in October 1999, he became Deputy Chairman of the Policy Research Council, which he held until July 2000. In April 2001, he became Chairman, which he held until September 2003. In the Executive – In November 1996, Aso was made	Minister of State in Economic Planning Agency by Ryutaro Hashimoto, which he held until Sep 1997. From January 2001, Aso Minister of State, Economic and Fiscal Policy under Yoshiro Mori until the end of Mori’s term in April 2001. In 2003 he became Minister of Internal Affairs, Posts and Communications to Jun’ichiro Koizumi, and on 31 October 2005, he became Minister for Foreign Affairs, a post he has retained in Shinzo Abe’s first cabinet. During the leadership contest within the LDP following the stepping-down of Koizumi, Aso was a candidate running against Shinzo Abe. Chikako Aso (???? ?, Asou Chikako) is the third daughter of Zenko Suzuki (??? ?, Suzuki Zenkou), the 70th Prime Minister of Japan (July 1980-November 1982). Update: His son, Masahiro Aso, attends William Jewell College in Liberty, Missouri and is set to graduate in 2011. [Thanks to the anonymous commenter!] I cannot verify this independently because the Japanese newspapers appear to have a great deal of respect for the rights of minors – I can’t find anything on his son or daughter, except that he has at least one of each, both at university. Update 2: Josei Jishin (??? 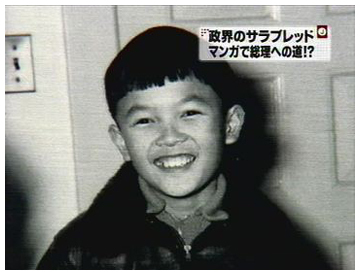 ?, October 2008) reported on now-Prime Minister Aso’s children. Masahiro (??) was born December 29, 1984. He graduated from prestigious Keio Gijuku Yochisha Primary School and Keio Shonan Fujisawa Junior and Senior High School. 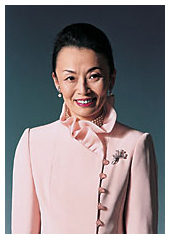 Taro Aso’s daughter Ayako (??) was born on April 27, 1987. She is now a sophomore at the University of Tokyo. (Thanks to commenter Kazu for the information). The third daughter of the Aso family, Nobuko (?? ), studied in the UK at Rosslyn House College (about which I can find nothing) and graduated in 1973. She met and married Prince Tomohito of Mikasa (???? ?, Mikasa no Miya Tomohito Shinnou), heir to the mikasa no miya(House of Mikasa), and became Princess Tomohito of Mikasa (?????? ?, Tomohito Shinnouhi Nobuko). Together they have two children, Princesses Akiko (??? ?, Akiko Joou), currently studying at Oxford, and Yoko (??? ?, Youko Joou). It was Prince Tomohito who suggested that Crown Prince Naruhito should take a concubine in order to produce an heir. He is a cousin of the current Emperor Akihito. The second son of the Aso family is Jiro (? ?, Jirou [?]). The first daughter of the Aso family, Setsuko (? ?, [? – perhaps Yukiko]), married Kazutane Soma (??? ?, Souma Kazutane), the 33rd descendent of the Soma clan. The second daughter of the Aso family, Asako (??) married former ambassador to Spain, Kiyohiko Arafune (????). The youngest son of the Aso family, Yutaka (?) is the current head of the Aso Group. Taro Aso’s mother was Kazuko Yoshida (???? ), whose father was Shigeru Yoshida (??? ), one of Japan’s great post-war prime ministers (1946-1947, 1948-1954). He formulated what has become known as the Yoshida Doctrine, a process of ‘free-riding’ on security issues while concentrating heavily on economic strength. His doctrine dominated Japanese thought at least until the supposed dishonour brought upon Japan by its response to the 1991 Gulf War. He signed both the Treaty of San Francisco (1951) and the US-Japan Security Treaty (1951), both crucial to Japan’s reconstruction. Yoshida was by birth a Takeuchi, but was adopted by Kenzo Yoshida (a silk merchant) after they lived together. 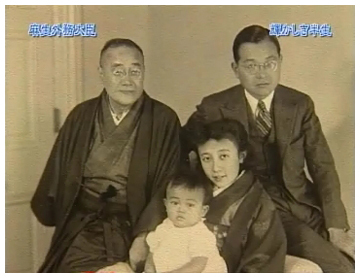 The picture above shows Aso as a baby in the lap of Kazuko Aso née Yoshida, with Shigeru Yoshida (left) and Takakichi Aso (right). In addition to the link to Shigeru Yoshida, Aso’s father had close ties to Kakuei Tanaka (???? ), Japan’s Prime Minister from 1972-1974. Tanaka also had a child in Koizumi’s cabinet, Makiko Tanaka (????? 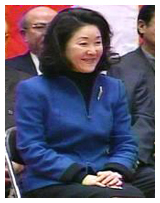 ), who was Japan’s Foreign Minister from April 2001 to January 2002. Tsuna Takeuchi was Shigeru Yoshida’s biological father. He is more commonly known in English as Tsuna Takenouchi, but this is infact incorrect: ??? in this case is readTsuna Takeuchi. Takeuchi was a key figure in Japanese civil rights politics hailing from the Tosa (??) clan (from Shikoku). Yoshida was Takeuchi’s fifth son whose mother was rumoured to be a geisha. Takeuchi was a leader of the Movement for Liberty and Civil Rights (????? ?, jiyuu minken undou) and was in prison during Yoshida’s birth, hence Yoshida’s time with Kenzo Yoshida. Yoshida’s wife, Yukiko, was the daughter of Nobuaki Makino (????) of theSatsuma clan. Like his son-in-law, Makino was adopted. He attended the Paris Peace Conference in 1919 as Japan’s ambassador pleponitary. He was Minister for the Imperial Household in 1921 and became a baron (? ?, danshaku) and then a count (? ?, hakushaku) under the kazoku (??) peerage system during his time as Lord Keeper of the Privy Seal of Japan (?? ?, Naidaijin), which became an incredibly powerful position under his charge. Count Makino’s biological father was Toshimichi Okubo (??? ? ?, Ookubo Toshimichi), a Satsuma samurai who played a lead role in the Meiji Restoration. He played a key role in allying the Satsuma and Choshu clans against the Shogunate, and was part of the provisional government with Saigo Takamori and Kido Takayoshi. Okubo, as Finance Minister, ended discrimination against the eta-hinin. He was part of the very important around-the-world Iwakura mission to renegotiate unequal treaties with the major powers and collect information crucial to Japan’s modernisation. This final figure might be the jewel in Aso’s genealogical crown, of which there are many gems to choose from. Furthermore, given Aso’s hobbies, Taro Aso probably read about Okubo in Rurouni Kenshin, the great samurai epic. It is safe to say that Taro Aso was handed a political destiny, it only remains to be seen how far he will go. I have prepared two pdf documents for you. The first is an overview of Taro Aso’s relation to his kinsmen, see how many names you can recognise: Aso Kinship Chart. The second is a large family tree, as detailed as I could make it without going too far off the reservation: Aso Family Tree. The family tree was adapted from Taro Aso’s Japanese Wikipedia page. The names of some of the family may not be correct (uncertainty is shown with a bracketed question mark), however, the Kanji always derives from the Wikipedia page.